My buddy put this together for me the other day as I was looking over his shoulder…a nice little (Warriors-colored) stamp to add to my ebay photos. I really need to learn some photoshop, though. Anyone know of any good resources out there? I just learned something interesting. 2013 Halloween party numero uno. Saturday was a good day. I got up early, took a bunch of eBay pics, had a nice omelette for breakfast…watched ‘After Earth.’ Toni and I then went for a bike ride through the park and then the wiggle…then we took a nap. We had be debating whether or not we were going to go.. 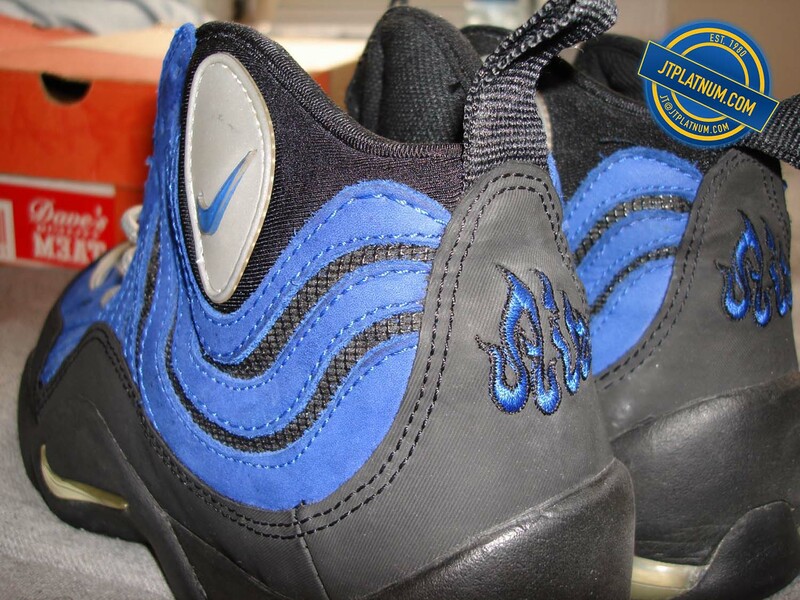 This dude SBTG kinda came outta nowhere and ended up making a pretty big impact on the custom sneaker market. When he first started releasing pairs, I really just thought he was a local (NY) dude trying to make a name for himself…the prices on this kicks were comparable to retail prices and I did..
That’s me in the alley next to my office building, with my friends bike. My friend took this trying to show me how I should take a picture of him with his bike. Dope pic. Caught this on the corner of Grant and Sutter (maybe?). I thought it was a pretty cool poster. So, yesterday, I was riding my bike home and ran a stop sign on The Wiggle. A cop on a motorcycle was sitting right there picking people off left and right – he pointed me out and yelled ‘You, COME HERE!’ I pulled up next time him knowing I had no defense (other than the..
Dan had me sell these for him, too. Every pairs was an OG and he had me sell each BEFORE they were retroed…They were all falling apart but people still paid a lot for them…I guess they didn’t think Nike would do them like that but I’m glad they did because these were completely unwearable. Be sure to watch this video when NOBODY is around. Apparently I’m years late with this but… I fell down the Vice rabbit hole the other day and came across a video that made me blush…even though I was at home…alone…and nobody else was around. This video and song has got me feeling some sort of way, I just don’t know what it is. One of the best feelings. I love it when I make a sale on ebay. I love ‘cha-ching’ my phone makes when I get a payment. I love seeing how much cash I made. Packing up the shoes and affixing the label is always a pain, but… I ABSOLUTELY LOVE dropping these boxes off at the post office. I walk.. I don’t know how or where I came across Minus the Bear, but I downloaded their latest album (about a year ago) while stuck in a hotel room in Addis Ababa, Ethiopia. We listened to it quite a few times on that trip…but…any time I hear Infinity Overhead, I think of that hotel room. Anyway,..
One of the better things about living in SF. For me, at least. Levi’s world headquarters is in SF. Right downtown by the Embarcadero. One of the first things I like to do when moving to a new place is seek out the Thrift shops. And every single thrift shop I’ve been to in San Francisco has quite a varied selection of Levi’s. And they’re all cheap. And.. I must confess…I have a fascination with North Korea. My fascination started with a Nat Geo documentary, then this Vice Guide to Travel, then a book called ‘Long Road Home’ and another book called ‘Escape from Camp 14’. I’ve got one more in the queue called ‘Nothing to Envy’. This stuff really screws with my.. I made a couple of rookie mistakes in the last couple of days…I changed domain hosting without backing up my info. I lost about 10-20 posts…damn. Yes, I’ll be the first to say it – I discovered this band before anyone else did. And I’m proud of that fact. My friend Mike and I went to BB Kings in New York to see Slick Rick, Scarface & Goodie Mob in concert back in 2009 or 2010 and these guys from Boston,..
I’m not big on keeping up with latest version of expensive things. I bought an iPhone 4 three and a half years ago and it’s pretty much held up for me during that time. As with most things being used for hours upon hours over the course of more than a thousand days, it’s started.. Being that I pretty much grew up on a skateboard, I’m a huge fan of Jim Phillips’ art. Check it out. We watched a very interesting documentary last night about fans of the Stanley Kubrick movie ‘The Shining’. A few of the theories were fascinating…I can’t say I bought them all but…wow. Highly recommended. Back when I moved to New York in 2003, the day after the blackout, I literally got off the plane after a redeye and took a cab to my Great Aunts house in Bay Ridge, Brooklyn. Even the cabbie had trouble finding Mackay Place. I had met my Great Aunt, once, back in the late.. If you haven’t checked out Big KRIT yet, I’d highly recommend him (again). Definitely my favorite *new* rapper since maybe K’naan. If you’ve been around me any time within the past 2 (almost 3) years and asked me about what I’m listening to, I’m sure I’ve told you about this dude. And I’m sure you’ve ignored..
Just started this book the other day. It’s basically the life story of Vegan ultramarathoner Scott Jurek – this dude is the truth. I don’t know why, but when I feel like aspects of my life are lacking I feel the need to read about them as they stay fresh in my mind. Right now.. If you know me, you know I’ve been a Golden State Warrior fan for as long as I can remember. There was once a time I could name every shady trade, every bad decision, every ridiculous front office call. I loathed GSW management. Immediately after graduating from College, I got a job as a Front.. Picked up the other day at NTSF. Didn’t even realize it until Toni pointed it out…gettin kinda sick of Nike. I don’t know if the quality has really gone downhill recently or it’s just something I began noticing when I started picking up other brands. There used to be a really nice 9-foot hoop behind the Truckee Recs department, which made for some awesome photos for guys like me who couldn’t do anything special on a 10-foot regulation hoop. Cruz and I went out there one day for a nice little photo shoot. Here’s a few few of my favorites:..
Back in 2005 or 2006, Toni got me tickets to see Arrested Development at the Brooklyn Academy of Music (BAM!). It was around Christmas and we made our way from Bay Ridge up to Flatbush and I believe we had front row seats…a couple of things I’ll always remember about this show – first, it..
As a kid I spent countless hours in this fine establishment digging through the crates. I went in these places so often (the nearest one was in Reno, NV), that I knew I’d see 95% of what I’d find in the racks the previous week I was there. I knew exactly where to look for..